"This company is the gold standard of tub and tub surround work! From beginning to end, this was a fantastic experience. I gathered 5 other proposals and none were as comprehensive as Elite Bath Solutions in terms of the scope of the work which included removing the old tub, re-plumbing the drain, replacing the walls with green board, installing a quality tub surround which included a ceiling panel, and repairing part of a wall that that had been damaged by water. The work was completed in 2 days with exceptional courtesy and craftsmanship. A ten star rating would be more accurate!" "Elite Bath is the BEST! I chose Elite because of their obvious attention and concern for the details right from the beginning, and because they explained everything that they would do to get rid of the mold problem. They didn't just cover it up, they replaced the walls, some rotting wood, got rid of a nest of ants, and changed out the shower piping and trap on the tub. Their approach is preventative - they do it all thoroughly and properly - so there's no chance of problems later on. They're hard working, honest, easy to discuss ideas with, and VERY detail oriented. Very happy with the end result - Very highly recommend them! 5 stars? 10!!" I recently had the two bathrooms in my house remodeled by Rob and Greg. They both came highly recommended, and I can understand why. During my first meeting with Rob, he listened to my ideas; it was obvious he knew what he was doing and suggested things that I had never thought about. 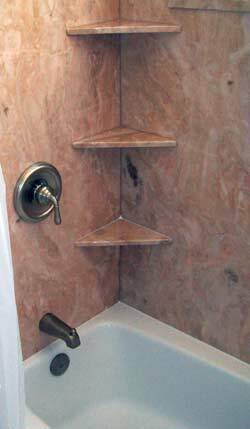 His experience in bathroom remodeling was evident just in the planning stages. During the actual remodeling I moved out of the house because I only have two bathrooms and they were both being worked on; this was my choice. I did spend the daytime at my house. Rob and Greg worked very well together. At the end of each day they cleaned up, hauling the garbage away. The result of their labors was quite wonderful. Both bathrooms exceeded my expectations. I am so glad that I listened to Rob’s suggestions during the planning stages. I would not hesitate to hire them both again to do future remodeling. My experience with Elite Bath Solutions was probably the best experience I have had with any type of vendor. Katy was very prompt in setting up an appointment and coming out as scheduled. We went through the project and she had a quote to me the very next day. They were the second company we had come out to look at our shower project. Our decision to utilize them for our project was confirmed after emailing back and forth with Maggie who posted here. Greg came out for final measurements and we felt even more comfortable with our decision. The big day was yesterday and Greg knocked it out of the park. We are very happy!! !